MUFF WIGGLER :: View topic - Interest in Highly Liquid's MIDI CPU? Interest in Highly Liquid's MIDI CPU? After doing a small run of Highly Liquid's UMR2 I was wondering if anyone would be interested for assembled boards/pcbs of the MIDi CPU. Price should be around $10/u (same as the UMR2). I will get a quote if enough people are interested. I'm going to be using it to create controllers for some of my rack mounted gear and some MIDI control modules. Its seems like a great tool for MIDI prototyping. I installed a MIDI CPU in my Moog T2 bass pedals and they work great. Would like to find a couple more. Very neat product. I'd be in for at least 3x of these (edit: 4x please), if the PCB pricing and European shipping stays the same as UMR2. Count me in for 5! Great, I'm going to get a quote from my manufacturer and will keep on taking orders. I might do a smaller run but would like to keep it under $10/unit. Definitely 2 for me, please! The more MIDI controllers, the better, I say! I'd be in for 2. I just checked with the factory and price is around $12 per unit for 50. I'm getting another quote for 100 to see if I can get it below $10/u. you may want to contact Modular Addict and/or SynthCube and see if they want to carry any. I suppose you could also list any extras on Tindie. I might contact them, especially for the bare pcbs. Got a quote and it looks like we are good for $10/unit. I will have production start next week, the boards should be ready to ship in under a month (including delays related to the Chinese new year). I’ll take a couple... am I too late? There was a small delay in production but everything should get here soon. I will message everyone privately once it is ready. I will keep on taking orders for at least 2 weeks! I'm in the process of building the programming rig. Orders will be ready to ship at the end of the week. I will message everyone when ready! Hey I want a couple! Hey, great Nice coincidence, a friend who we're splitting my order with was just asking a couple of days ago about the status. Everything is going well, I managed to create the programming rig and start programming the boards. 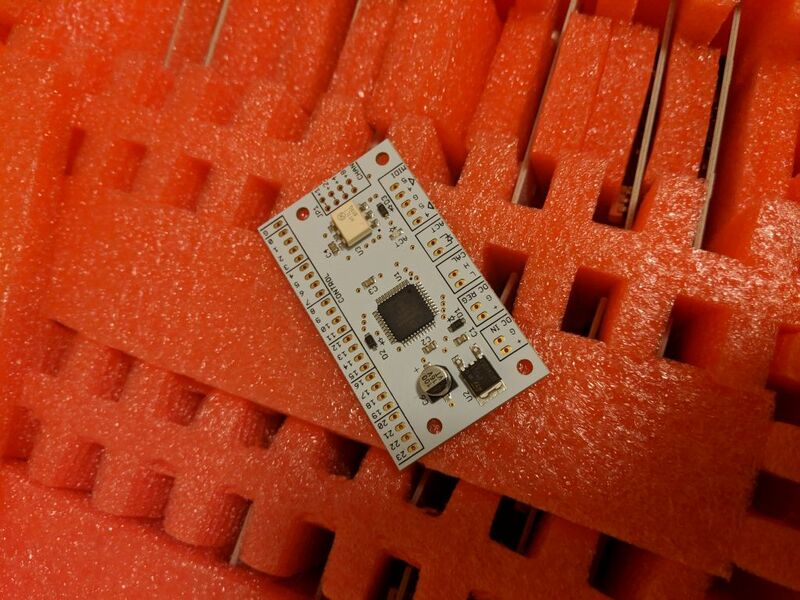 I still need to perform one test tonight to be sure that the boards are 100% tested and ready for shipping. Given that everything goes well, you should get a PM tomorrow with the order info. I messaged everyone, orders will be shipped starting tomorrow morning! If anyone still wants to order just message me with your address, paypal and order quantity. Got mine today; thank you!! Yeah, I got mine yesterday, too! Great service! Just saw this. Just so people are aware, this is in violation of the sales policies here - although it kind of squeezes into the grey area of what happens here in the DIY forum. You should really have 100 posts before selling things directly here. As I see it's already happening, not much we can or should do at this point, except, let us know (the moderators) if anything goes wrong.